Drains shall be Rockford Combination Separator-Drains, as manufactured by Rockford Separators, Inc., Rockford, Illinois, and as noted on plans. Furnish ______Rockford Model SD-______all-welded steel combination separator-drains, ______" (tapped) (hubbed) outlet with outlet vent connection, ______" internal rear vent connection, visible double-wall outside trap seal, (easily removable) (tamper-proof) non-breakable inlet grate of (steel) (polished brass) with slotted inlet grate openings, grate suitable for ______ (specify pedestrian traffic or reinforced for heavy vehicular traffic), removable sediment and mud pan, separator screen, and filter screen, OPEX® Shop Coat coating inside, bituminous coating outside. Inlet grate of stainless steel, concrete anchor flange with or without non-puncturing clamping ring, weep holes. Epoxy coated. Circular inlet grate openings. Integral extensions available. All standard grates are made with ASTM A242 material. A) Stock grates rated at 500# wheel load.B) Light traffic rated at 1000# wheel load (H-10). C) Heavy traffic rated at 16,000# wheel load (H-20). These are combination separator drains. When an extension is needed to meet deep roughing-in of the outlet, select the separator drain of the right size and capacity from the table. Then determine required dimension A from center of outlet to top of inlet grate. Dimension A is variable and can be specified to a fraction of an inch; integral extensions in 6-inch increments indicate price breaks. 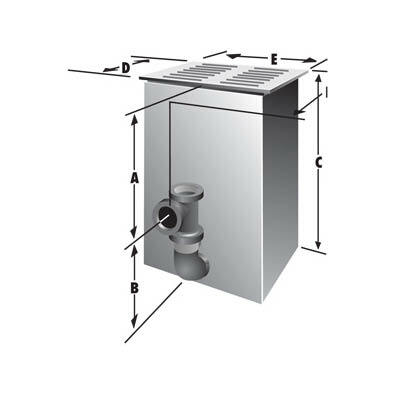 Dimension A plus dimension B is the overall height of separator drain C.
+ 3/8" x 3" slots (optional circular openings not available on SD-18 – 3/8" x 3" slots only).